I’m not one for conspiracy theories. Despite the recent CIA admission that Area 51 does, indeed, exist, I don’t believe that little green guys from a distant planet are playing an extraterrestrial version of “Punk’d” on the citizens — all 57 of ‘em — of Rachel, Nev. Likewise, I don’t believe that the Moon Landing was an elaborate hoax or that Elvis Presley hasn’t left the building. But I’m concerned about Saturday’s Travers Stakes. In what way, you ask? Have I received word that Tupac Shakur will be listed as a late rider change, replacing Joel Rosario aboard Orb? Am I privy to inside information on Moreno? We all know that even Tupac’s hologram is too heavy to ride Orb and that trainer Eric Guillot would never pass on secret information regarding his stable star — he’s already made his thoughts on Moreno public… over and over again. No, my suspicions have to do with the tactics of two primary contenders in Saturday’s Saratoga feature and the unintended consequences of an oft-dissed and dismissed racing rule. You see, back in the early days of racing, the powers that be realized that horses owned and/or trained by the same individual(s) presented a dilemma to the betting public: mainly, that one or more of those entrants would be in the race strictly to benefit one of the others. For example, everybody with functioning gray cells knows that Hedevar was not entered to win the 1967 Woodward Stakes or the 1968 Brooklyn Handicap. Trainer Frank Whitely, Jr. entered Hedevar in those races for one reason and one reason only: to run Dr. Fager off his feet and set the table for Damascus, Whitely’s 1967 Horse of the Year. However, since both Hedevar and Damascus were coupled in the wagering, i.e. they ran as a single betting interest, it really didn’t matter what Hedevar did — unless you were a fan of Dr. Fager, of course (sportsmanship is not the issue I’m tackling here). Over the years, as field sizes waned and the public’s appetite for more betting choices increased, the rules governing coupled entries have been greatly relaxed. 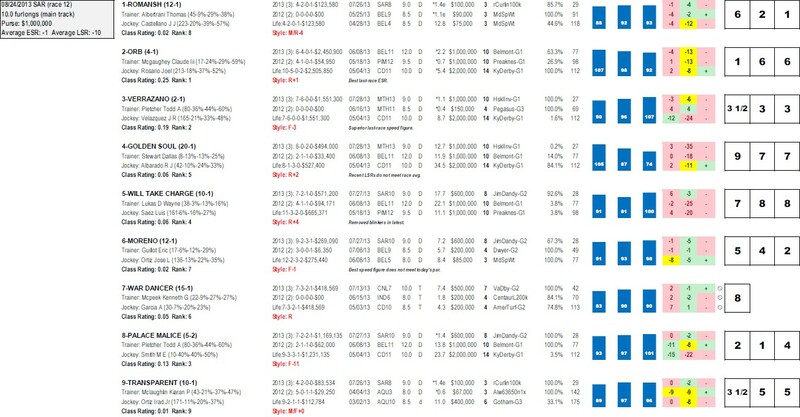 Today it is not uncommon to see horses owned by the same connections listed as separate betting interests. For the most part, these relaxed rules have not posed a problem… but Saturday’s Travers Stakes is different. In the Travers, two of the main contenders, both trained by Todd Pletcher, have similar running styles and what they decide to do, tactically, could literally spell the difference between victory and defeat — for one or both of them. Of course, I’m talking about Verrazano, the 2-1 morning line favorite in the Travers, and Palace Malice, the 5-2 second choice. NOTE: Click HERE for a free sample report that explains what the data above means. Both horses like to be on or near the pace and, while I was not overly impressed with Verrazano’s latest score in the Haskell (I thought the -6 late speed ration was a little weak), I do think that his success — or lack thereof — hinges on what his stablemate elects to do. Simply put, Palace Malice is incredibly versatile. He won the Belmont after recording a ridiculously fast -11 early speed ration and, then, rated beautifully in the Jim Dandy while earning a 0 ESR. When one considers that both Verrazano and Moreno prefer a slow and steady pace — Guillot has publicly admitted this (I told you earlier the guy likes to talk) — I think “Palace” should press the early issue. In effect, do to Moreno and Verrazano what Hedevar did to Dr. Fager nearly 40 years ago — run them off their feet. The question is: Will he? Will Pletcher allow one of his entries to compromise the chances of the other? Or will he play it safe and send neither horse to the lead. Guillot paints a picture of what could happen should the latter transpire. "I would imagine Todd wouldn't be pressing his own horse with Palace Malice and Verrazano together; that wouldn't make much sense," he told The Bloodhorse. "So, somebody's going to push me, and, hopefully, they push me so far up front, or push me to the point where the other one can't catch up. That would be the best-case scenario." This is why the coupling rules were initially put in place… and why I’m concerned about the Travers Stakes. On this week’s “Simon Says” podcast for TwinSpires.com, I had an interesting discussion with Ed DeRosa about the so-called East Coast Bias. Knowing that my colleague was born in Ohio — he recently went back and his city was gone (sorry, I couldn’t help myself) — I naturally assumed that Ed would vehemently disagree with my assertion that the East Coast Bias in racing is alive and well. Much to my surprise, Ed agreed with me. 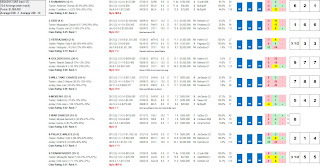 Click HERE to receive your free Win Factor Report for Saturday’s Jackpot Five races.